Story time. I have a miniature poodle as well as a great dane. The poodle snuck through the fence somehow and was found by the city and taken to the shelter. I picked her up and about a week later she developed what I thought was kennel cough.. 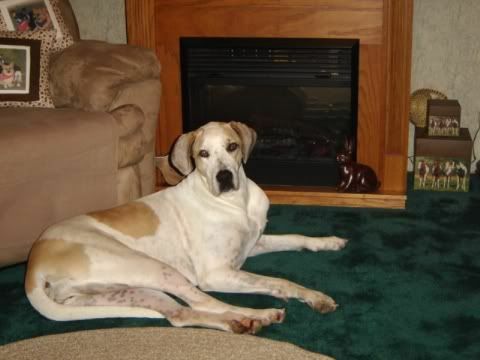 I had no idea how to quarantine the puppy but I kept it's food and water away from my dane. They didn't sleep together either, which I know doesn't matter. I did what I could living alone and working full time. The puppy is just about healed up and I've been giving her cough medicine and honey to soothe her throat. So I wake up this morning and my great dane has diarrhea... EXPLOSIVE . it's on all of my shoes, on several walls on my piano, on blankets, all over my bathroom and base boards. Disgusting , but I feel for her. I called in to work and have been cleaning all day, literally. She's gone diarrhea about 6 times outside. She's drinking lots of water still, isn't looking very bad at all. I've fed her some chicken and rice and given her some tums to settle her stomach. She just popped all over the house again and my brain is in shut down mode. All over my fireplace, couch... She even squirted on the puppy. This all happened sudden ly. What do you recommend I do to ease this? Pedialite, more rice, bread? I NEED to go to work for a bit tomorrow and my mom said she'd watch the dogs. I need help. If this doesn't stop I'm gonna schedule a vet visit and hopefully get some antibiotics. Paisley is 4.5 years old if that matters. Up to date on all her vaccinations as well. Last edited by kenfowler; 02-07-2019, 05:32 PM. If possible confine her in an easy to clean room or area.. How is she acting? How is her appetite? Does she have a temp? Any new foods or treats? Diarrhea can be as simple as just eating something they shouldn't or over eating to something more serious. It can also cause dehydration. Withhold any food for at least 12 hours and then give boiled chicken and white rice..you can also give plain Greek Yogurt and plain pumpkin to help. I do suggest that you put a call in to your vet to get their input. My house is really open Best I can do is shut all the doors, block off tree stairs and pray lol she's acting fine. She's pretty lazy usual so nothing drastically different. She's eaten a lot today and had a lot of water. I don't think she has a temp but I don't know how to test that. No new food or treats either. I've been feeding her chicken and rice today and was gonna go get pumpkin soon. I was going to wait a couple of days and see if it gets better then call a vet if needed. I don't want to procrastinate but also don't want to overreact. She's asleep now but that's nothing new. Last edited by kenfowler; 02-07-2019, 06:35 PM. at least you're able to keep your sense of humor. i had this happen ONE time many years ago and i don't care if it ever happens again! i would call your vet right away and see about getting some meds. they will usually give metronidazole (aka flagyl) for diarrhea. they may want to see her before giving anything which would be a good idea anyway, especially if this is still going on today. it's possible that, even with the bland diet you're feeding, her g.i. tract is so irritated that any food at all is just creating a vicious circle. also, have your vet show you how to take her temp (rectally). it's easy peasy to do and it's one of the first things you should do any time your dog is ill or even seems "off". good luck and let us know how she's doing! Well, the diarrhea is gone, her poop is a little more solid now... But she hasn't pooped for 24 hrs now. And.... She has kennel cough now that the puppy is pretty much healed up. She sounds much worse though, like a wheezing sound and big globs of white phlegm. It's destroying my carpet. I try to dab it up and it's so think and stinks. I am gonna have to shampoo carpets again. Hardly any sleep all week, I feel dead. She's eating and drinking but is quite lethargic. I feel bad but am also quite annoyed at this point. At what point do you go to the vet I hate overreacting but don't want to procrastinate. Kennel cough seems to be quite common and more of an annoyance than a huge health concern. I'm gonna take her in tomorrow. Sadly she doesn't have an actual vet, she's been so healthy. I just take her to the shot clinics for boosters. Apparently I cannot upload pictures on here, strange. I've looked at youtube videos and some of the dogs are hacking up gross white mucous as well. If this is a bad case of kennel cough 3 weeks of this is going to be hell! I gave her some guaifeneson and it made the mucous worse, but that makes sense I suppose. It's off and on, like now, she hasn't coughed for 20 minutes or so and is eating ice ... Then I'm sure she'll randomly wheez and hack up phlegm. Last edited by kenfowler; 02-10-2019, 03:52 PM. this whole scenario absolutely requires a vet visit ASAP!! listen to kahluadanes, she knows what she's talking about!